Flash Special for Vendor Registration! Save 50% off your fee if you complete registration by Friday December 7. Table fee is just $20! Sign up below. The Holiday Extravaganza is a free event held in East Dallas, being publicized in channels across the DFW metroplex. The event is hosted by Read Play Love, a non-profit whose mission is to empower children through the arts. The event PR is being geared towards families. Date is Sat, December 15, 10am-2pm. 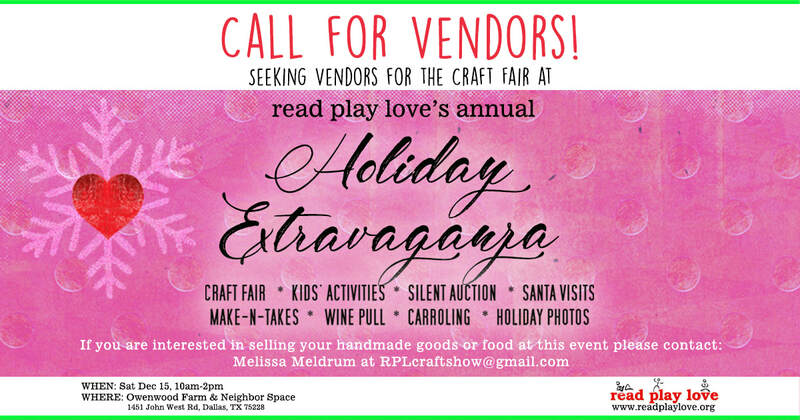 Vendor table is just $20 (half-price) if you register by Fri Dec 7! We accept and appreciation the donation of 1 item to our fundraising raffle, but do not require it. 3. You will receive confirmation of your reservation upon receipt. VENDOR FEE is JUST $20 (half-price) if you register before Friday Dec 7!